For jaw dropping giant cupcakes, this non-stick jumbo cupcake baking tin does just the job. The two section pan, creates a fantastic base and top shape for easy decorating after baking to produce a show stopping cake you will be proud to show off. View more from Novelty Cake Pans, Cupcake & Muffin Pans, Cupcake Collection, Cake Tools. Very Happy with the Item, good quality product and it works very well! 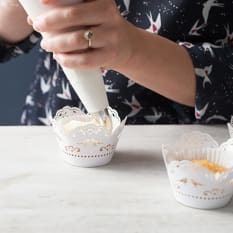 Looking at the dimensions I thought it was a cupcake with a base of 20cm tapering out to 40cm not realising the diameter was 20cm and the 40cm was the width of the top and base together. It is indeed a Jumbo cupcake, but not big enough to be a birthday cake all on its own. The perfect size for my daughter's first birthday cake! A lovely sturdy pan. Unfortunately I have not yet tried baking in it, but I am sure it will work as well as it looks.